A successful crowdfunding campaign isn’t one where you just sit back and let the platform do all the work. You first need to determine your audience before you can share and draw their interest with a clearly defined and carefully crafted vision. You can help do this with a direct and effective pitch video. And finally you want to offer incentives that are not only personal, but also visual and shareable. Emily Best is CEO of the most successful crowdfunding site in the world, Seed and Spark. What started as a personal fundraising campaign turned into a startup dedicated to helping independent filmmakers launch successful crowdfunding endeavors. Rich: So you’re helping people create better crowdfunding campaigns. So what are some of the things that you can share with us today that if we wanted to get into crowdfunding are going to make a difference to us reaching our goals? Emily: Well first and foremost, know your audience. And the way that you know your audience is not the audience that you invent in your head. So what we do when we teach a workshop is we say, “Ok, who in the crowd has a movie that they’re ready to crowdfund?” And somebody raises their hand and we say, “Great, give us the logline and synopsis for your movie.” And they give the logline and synopsis for their movie and then we look at the crowd and say, “Who would like to see that movie?” Then hands go up and the filmmaker looks around and inevitably is surprised by the diversity of hands that have gone up. They’re surprised that people of a certain gender, ethnicity or race would even be interested in the movie that they just described. Learning as many elements and touchpoints about your audience that may affect how you create messaging and marketing materials. If you discover that 80% of your people are on Twitter in the evenings, and they for the most part are actually getting their news from Buzzfeed, well that gives you a really clear sense of what kind of headlines you have to write, what kind of tweets you have to write, where you’re writing them and who is influencing those people, so who you should be pushing those to. Does that make sense? Rich: Yeah, that makes a lot of sense. Emily: And that’s just the beginning and we really recommend that people sort of push on this message testing process for some time. And I think you shouldn’t start a crowdfunding campaign before you have proven your ability to get strangers to sit up and take notice of what you’re doing. Rich: And how can you test that? Emily: On the internet. The thing is, you have those tools in your pocket. I learned yesterday that in the U.S., 91% of American consumers own smartphones. That means everyone is online somewhere, they are reachable. So there’s lots of platforms out there, and the most important thing is to find a couple of people who you might already know who are interested in what you are doing and interview them. And if you find that all 5 of them were all on Twitter and no place else, or 4 of them say Facebook and Twitter and 1 of them says Tumblr, you sort of decide how much time you want to spend on Tumblr versus Facebook and Twitter. And you learn about the platforms where your audience is hanging out and sort of the rules and regulations that go along in to them. But mostly you go there and you engage in a conversation around what you are doing. At Seed and Spark we spent a year on Tumblr and Facebook talking about films, interesting things, new development, before we ever launched the company. And we were engaging deeply in conversations with people publicly and privately in order to better understand the landscape for what we’re doing. Rich: Alright, so that definitely helps us try and find that audience. Now my experience in crowdfunding has been your drawn or driven to a page – very often there’s a video there – that kind of explains what the product or service or movie is all about, and some information and then basically a series of incentives to join. For example, my most recent crowdfunding experience was for a movie. It was Night Of The Living Deb, which is a romantic comedy zombie movie that’s coming out, it was filmed here in Maine. And for $200 you could be in the movie, which is exactly what happened with me. So what would you say about that? Are incentives an important part, and what kind of incentives might get your audience to contribute, or is that that wrong way to go about it? Emily: Again, you have to ask them. This is why it’s so important to engage them early and often because you shouldn’t be building your campaign independent of what your audience is intrigued by. So if it turns out that a lot of the audience is really engaging with you – it isn’t LA or New York – so for us this was a big one. One of the incentives that was really kind of cool for people in our campaign for Like The Water, was being in the movie. Coming to be an extra. And let me tell you something, extras who are paying to be there show up on time and better prepared than extras who are being paid to be there. That has been my experience. Rich: I can say anecdotally that I was totally prepared for my movie, my moment as a zombie. Emily: I bet! Yeah, because it’s really exciting. So you learn form your audience. If you’re not in a filmmaking town, it may be really exciting for people to get to come and participate in your film. If you’re in a filmmaking town, maybe what you need to offer is tools for filmmakers. So what we see a lot is projects that have award winning editors, for example, and the editors will offer an hour or two of their time to cut your demo reel or things like that. The other thing is there could be a whole bunch of people say, when you ask them what they do with their free time, “Oh, I volunteer”, or “I’m particularly interested in these 3 nonprofit organizations”. Well, if one of them comes up over and over again, it’s certainly worth reaching out and seeing if you can afford a partnership with an organization that a lot of your audience seems to be interested in. And that’s really cool, because that;s when you can really start to amplify your efforts. Rich: What I’m hearing you say is, when it comes to fundraising for movies first of all you want to find the people that are interested in your movie. So in short, you’re creating a movie for your audience, that’s going to be of interest to them. And then to get them on board with contributing, you can incentivize them with some of the incentives by finding out what it is that they want, and then creating that experience or that product for them. So I would say that in the real world, well for example, Agents of Change. This is an idea I’ve been playing around with for awhile. I want to be able to take a lot of college students who are interested in marketing and be able to give them at least the digital pass for free. And so one of the things I was thinking about is – now I don’t expect them to crowdfund it – but talking about people who might want ot buy a digital pass and then they also could gift one for a college student. As I think about this now I say that’s great for the college students, but I don’t know if I’ve necessarily given a strong enough incentive or given people what they want. It may be they seem to think, “Oh yeah, well a college student gets to go to this because I’m doing it.” What I need to figure out is what do the people who are interested in this want? Emily: Yeah, and specificity always helps. So I just want to go back really quickly and say the one distinction I would make about what you said before is not so much that you’re creating a movie for your audience, but you’re spending time figuring out what about your movie resonates with the audience. Rich: Ok, that’s definitely a different thing. Emily: Yeah. Well for filmmakers especially it’s like the clarity of vision is a very important central piece of the great filmmaker. They tend to have a singularity of vision. The difference is, if they want to take a singularity of vision and turn it into a business, they have to figure out who that singularity of vision is serving and how to talk about how it’s serving those people. And the only way that you can really do that is to go to them. So it was really interesting to me to think about how much an audience’s experience of what the writers were attempting to create and how it affected the way that they addressed their character’s development. And this to me is like a beautiful, perfect example. they made a bolder choice as a result of knowing that they have to serve their audience, not a more tepid, timid choice. I think the one thing about crowdfunding that gets people confused is when they start thinking about listening to your audience they think that’s going to infringe on their creative view. On the contrary, I think there are plenty of examples where actually it emboldens a creator to make scarier choices. The other piece of it is the specificity of your incentive is really important. So if what you want to do is bring college students, which college students and why. What will they get out of it? Why is it meaningful to a college student and what will the follow up be? What happens when a college student comes to this conference and takes in all this knowledge, will they have a way to come together afterwards? Will they get to meet the person who brought them there? To what extent is there a real one-to-one thing and why might it matter to me the most? Again, you have to find that out from your audience. If you said it was a buy one, get one – which is a very effective model – like Tom’s shoes and lots of companies that do that now. Tom’s puts shoes on small, adorable children’s feet, what is your version of that that your audience can really sink their teeth into? Rich: I just need to find small, adorable college students to start, and then I’ll figure out what the shoe is that I need to put on them. Rich: Something like that. So it feels like – and please correct me if I’m wrong – but you’re setting up a webpage somewhere for this crowdfunding, that’s where the rubber hits the road. We have to send people there because that’s where people can donate and get involved with our project. What are some of the tactics or techniques that you teach people to use for their own crowdfunding project? Is it Twitter, is it Facebook,what are the different things that we might want to do to kind of drive traffic and interest for our project? Emily: Well first of all, you’ll be driving traffic on the social platforms that your audience hangs out on. And I think the first tactic is you need to have a good video that expresses a real clarity of vision around your idea, that has a personal appeal and that is intriguing. So I don’t know why everyone, including a lot of product designers,start their pitch videos with somebody sitting and talking to a camera, which is almost never the product that you are trying to sell. So the first 15 seconds of your video has to blow the minds of your target audience. If you’re producing a product, show them in the first 15 seconds why that’s going to change their life or be the coolest thing. If you’re producing a movie, it should be the first 15 seconds in the tone of the movie you want to create to prove to us that you’re able to do it. The pitch videos generally should be short and to the point, 90 seconds to 2 minutes, tops.That’s really the most people will watch before they make a decision, unless there are sort of extensive product demos to be had. The incentives piece is a really good way to drive momentum. One of the things that we think is really important is that you’re $10 – $25 incentive – this may differ from the non-film world – that the minimum entry or most common entry in the film space is the $10 – $25 incentive. And those incentives should be personalized, visual and shareable. So if you’re doing something that is a product, oftentimes you’re just sending them the product. But if you step it up so that that first level incentive also includes something where on Twitter I share a thank you at @therichbrooks for your contribution to our Seed and Spark campaign, with an image of you photoshopped into your favorite independent film. It’s a small thing, it costs us nothing, it creates something that I am publicizing – I’m making you look good – and I’m making us look good and it’s something that you can share to become an amplifier. So you really want a lot of those first level incentives to act also as amplification mechanisms for the campaign. Rich: Alright, that makes a lot of sense. And those were personal, visual and what was the third one? You’ll need a team to sort of be speaking with one voice, you’ll want to organize all of your personal contacts, all of your extended group contacts, alumni associations, Google groups, and email lists you have access to. Certainly if you have partner organizations like nonprofits or others helping you with your outreach, you want to make sure they have the all the materials for an effective outreach. And the reason you want to gather those materials in advance – and we see this all the time – crowdfunding is super scary. Its really intimidating because you’re going out there with your idea and going, “Ok, I hope you like me!” No matter how badass and brash the team seems publicly – and the tone for any successful campaign is never” help me with a donation”, it’s “join what I am offering with a contribution”. You contribute and I contribute and we make something marvelous together. Behind the scenes it’s always very nerve wracking, and what will happen if you don’t have your language organized in advance is you’ll start to write updates and emails to your friends and family that sort of smack of increasing desperation. It’s true, nobody is immune to it. Rich: So after a while you start smelling like Axe body spray, is what you’re saying. Emily: Yes, yes. I’m going to use that one, Rich. Rich: By the way, I have to say I stole that from a Spiderman comic one time. A well written Spiderman comic, but I just have to throw that out there. Rich: I like that, momentum and inevitability of success. So is there an optimal length of time for a campaign? Emily: It really depends. I think for the larger campaigns we’re seeing 45 days is pretty good. We’re specifically built for audience building. I think crowdfunding, there’s a reason the word “funding” comes second, the crowd is way more important and you have to build it in advance. But the ancillary benefit to a crowdfunding campaign is the money. The important benefit is growing the crowd. And that takes a very concerted effort and takes time. And you need to have a plan for each week at how you’re going to sort of revamp your language, learn from the previous week, grow or address a different audience. Not 100% of your audience will be able to be talked to in the same way. Just for Seed and Spark we have filmmakers, we have audiences, we also publish a magazine, so we have print enthusiasts. And so we’re straddling audiences of creators, and actors and of all the sort of subsets inside, and they don’t all like to be talked to in the same way and they’re not all interested in the same things. So we have to be very conservative about how you address these folks. And in a crowdfunding campaign it’s really good to sort of concentrate each week or every 2 weeks on really deepening a relationship with one of those audiences. It can help keep your language fresh. You certainly don’t want ot be tweeting the same messaging in week 4 that you were in week 1, because everyone will have stopped listening to you and probably unfollowed you. Rich: And do you have a rule of thumb, the answer I’m sure depends, but how often should we be engaging with our audience? How often should we be sending out things from the campaign itself versus maybe one of the social channels we’re using? Emily: So for the updates, the blog updates, probably 2 a week. You want to use those really to announce big milestones and new developments and press and a deeper look at the business or the film. But as far as your social presence goes, all day every day. Emily: Yeah. Within reason. I’m not saying 2 tweets a minute. I’m just saying the last social guru stat I read was 3 years ago when we started the company they were saying it is a 3 to 1 ratio for effective social media marketing. That’s 3 posts about other things for every 1 self promotional post. And then 18 months ago I remember reading it was 5 to 1. And then the last time I read it it said 9 to 1. What does that mean, 9-1? Well that means you have to become a hub of interesting stuff around the idea. So if you need to promote yourself several times a day, that’s a lot of time that you’re also spending promoting other’s work, sharing interesting articles and ideas. And an example that I like to give is a really good friend of mine crowdfunded on Seed and Spark recently for a really cool short film about an astronaut’s last day on Earth in quarantine before a one way, manned mission to Mars. And her campaign was not only obviously stuff about the film, but just became a hub of information about outer space travel. It was awesome to follow her. Super exciting, super interesting, and so she became a hub of really interesting information that also drew people into her film. And the thing is, if you’re starting a business or you’re launching a campaign, you’re doing all this research anyway. You’re full of information – or at least you hope you are – in just being smart about your business. So you can just use that information to share with your crowd and bring them into your thinking and your inspiration. It’s a great way to be a part of a conversation. Rich: Very cool. So so far we’ve talked about knowing your audience, and we talked quite a bit about how to get a better understanding of them and what they’re interested in and where they’re hanging out online and engage them there, creating the campaign, creating incentives that are personal, visual and shareable, having some organization which means both having the right people to support you as well as knowing what your editorial calendar is so you know what you’re going to talk about week in and week out from the beginning right up until the end of the campaign. Is there anything else that we should know about before we jump into crowdfunding? Emily: Well, we created some templates – those editorial calendar templates – that are available for download on our website that are not film specific, anybody can use those so you don’t also have to reinvent the wheel. And there’s a ton of really good case studies and thinking out there about crowdfunding. Anyone that tells you that the platform will raise the money for you is lying to you. We have a really high success rate, not because our platform raises money for people, but because we educate every, single filmmaker before we let them launch their campaign. So they go through a rigorous process of feedback and information before they’re allowed to launch. We just have better prepared filmmakers. So this notion that on this platform versus this platform you’re going to have a higher success rate, it just isn’t true. 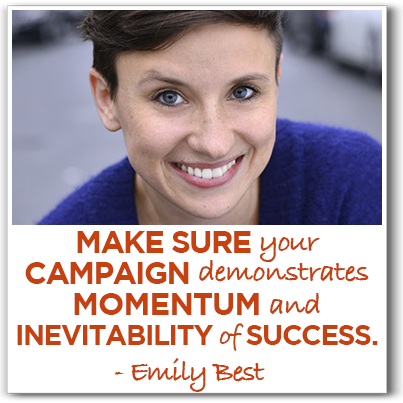 It always comes down to the preparedness and effectiveness of the campaign. Rich: That is very interesting stuff. And if you send me the links to where people can download those documents, we’ll make sure those go into the show notes. Rich: Hey, this has been great, Emily. I really appreciate all your hard time on this and the time that you spent with us. Where can we send people to go online so they can learn more about you and Seed and Spark? Emily: Well, come to seedandspark.com, first and foremost. You can follow us on Twitter at @seedandspark. We’re “seed and spark” everywhere, Instagram, Twitter and Facebook. And you can also tweet any additional questions you might have for me at @emilybest. Rich: Alright, awesome. Thanks again, Emily, for your time today. Emily: Yeah! Thank you so much. Learn more about Seed and Spark at their website. Editorial Calendar downloads as discussed in the show can be found here, under “awesome downloads”. Follow Emily and Seed and Spark everywhere on social media: Twitter (Seed and Spark), Twitter (personal), Instagram and Facebook. This entry was posted in Entrepreneurship and tagged crowdfunding, emily best, seed & spark by Rich Brooks. Bookmark the permalink. I think it’s great what Emily is doing for film makers. She has a lot of great insight, which I think can be applied to campaigns that aren’t only film focused. I have a feeling films can be harder to determine your audience. It’s not as simple as what demographic likes movies (chances are a lot). It’s not something like the Paragon Induction Cooktop on Indiegogo (http://bit.ly/1Bindiegogo), where they might have the narrowed focus of what demographic likes to cook the most. With movie making, I feel you have to focus on what type of movies each group of people like and have that be the focus of messaging and targeting. What are your thoughts?